The Trump administration's decision to end a key Obama-era protection for young immigrants sparked multiple protests Tuesday at San Francisco's City Hall and at the federal building. 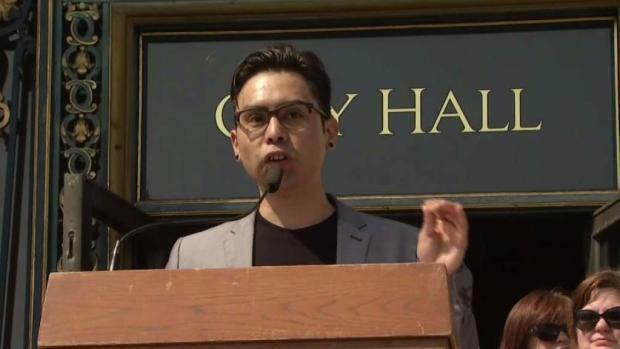 At the City Hall rally, recipients of the Deferred Action for Childhood Arrivals, or DACA, program spoke publicly about the personal impact of Tuesday's announcement. Community organizer Diana Flores was brought across the U.S.-Mexico border when she was 4 years old. For the past four years, she’s been working to help low-income families, addressing "the housing crisis and the impacts of displacement for black residents and brown residents of San Francisco," she said. Flores found a place to live in Oakland so she wouldn’t be taking a space from the people she was serving. The Trump administration's decision to end a key Obama-era protection for young immigrants sparked multiple protests Tuesday at San Francisco's City Hall and at the federal building. Mark Matthews reports. "As a single person looking for housing, it’s so much easier than a family of four looking for housing," she said. "So I wanted to take myself out of that equation." Another DACA recipient, Gerardo Gomez, is a senior at San Francisco State and is planning to apply for law school. His living and working in San Francisco really does have a lot to do with his ability to survive. And he said there's more to DACA than work permits and school. "What often doesn’t get talked about is the many other aspects of our lives that is affected through those work permits," said Gomez, whose parents brought him from Guerero, Mexico, to Palmdale when he was 3 years old. Gomez moved to San Francisco to go to college and will graduate in December with a degree in political science. He's also HIV positive and is taking meds provided by Healthy San Francisco. He said if he loses his job and can’t work, he’ll have to move. "And if I move, I will not qualify for city health insurance," he said, adding that he’ll never be able to afford the $3,000 a month that his meds would cost him without the Healthy San Francisco coverage. Inside City Hall, Mayor Ed Lee said the nation made a promise to Flores, Gomez and the other 800,000 DACA recipients that they would be protected if they stepped out of the shadows. "Today, the federal administration has broken that promise and turned their back on these young people," Lee said. "These individuals have only known our country as their home." Republican National Committee leader Harmeet Dhillon said the president's decision to end DACA will allow Congress to do its job, and maybe create an opportunity for compromise. "For example, a compromise could look like people in Congress on a bipartisan basis saying President Trump, you get your funding for your wall, and you legalize these people, and that’s it," Dhillon said. Rep. Eric Swalwell (D-Dublin) replied to that compromise idea with a statement that he would not give Republicans a pass to be a slight racist on Monday so that they could be fully racist on Tuesday.